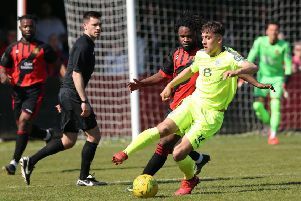 Hastings United Football Club will be targeting a first win in five league matches when it returns to home territory tonight (Tuesday). Chris Agutter’s side, which has drawn two and lost two of its last four Bostik Football League Division One South fixtures, will host Cray Wanderers. Kick-off at The Pilot Field is 7.45pm. A tough task awaits Hastings, though, because Cray are fourth in the table having won eight, drawn six and lost only one of their 15 league fixtures to date. Cray also boast the division’s best defensive record having conceded just nine league goals. Hastings are 14 points and 13 places below their opponents having won four, drawn four and lost seven of their 15 league matches. Their latest outing was a 1-1 draw away to bottom club Shoreham on Saturday when Dayjohonne Gelding netted a 91st minute goal on his debut to rescue a point for 10-man Hastings. Tonight’s game is the only one of Hastings’ seven scheduled league fixtures this month against a club currently in the top half of the table. Despite the difference in positions between the two clubs, Hastings did earn a 1-1 draw away to Cray in September’s reverse fixture. A penalty from the now departed Bradley Gayler gave Hastings a point in what turned out to be the final away game of previous manager Adam Hinshelwood’s short tenure at the club.